I don’t know what it is about figs, but I love them. The sweet, soft, earthy flavor and texture is amazing, and it doesn’t hurt that they are so dang pretty. In Texas we had a fig tree that I adored, and since moving away I feel emotionally obligated to buy this fun fruit when I see it, because it can be a tricky find during it’s summer season. Last week I decided to add the end of my stash onto the most simple, delicious mini no-bake cheesecakes and they were delicious. 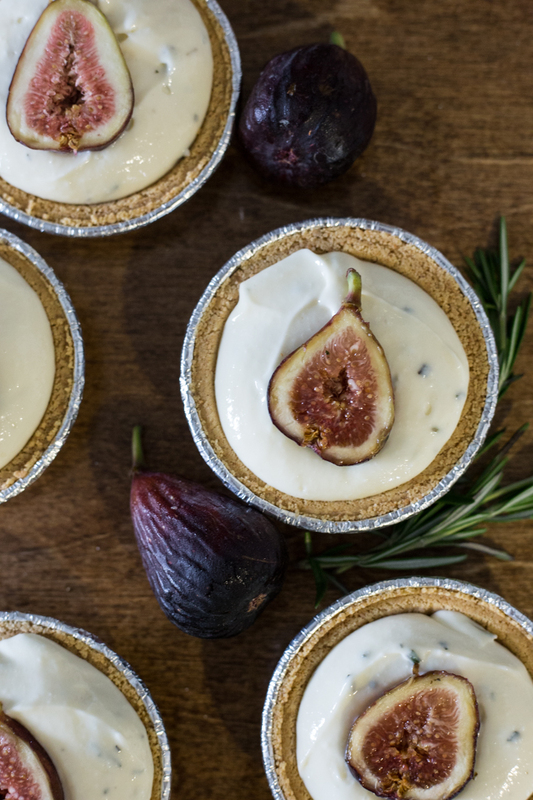 Only 6 ingredients, and about 5 minutes and these sweet little Rosemary Fig No-Bake Cheesecakes were ready to chill until after dinner. 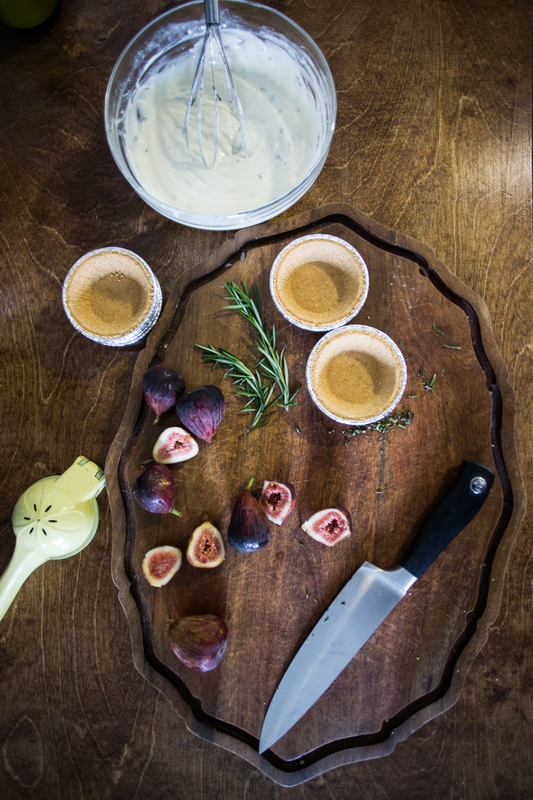 Although the figs are the shiny star of my recipe, they are only added to the top of the dessert, so could be really easily replaced by any other in-season fruit. Berries or stone fruit would also serve beautifully here. The no-bake cheesecake itself is the easiest throw-together dessert. Using a can of Eagle Brand sweetened condensed milk for sweetness (generously sent to me by Eagle Brand), a tub of whipped cream cheese for body and tang, and the juice of one lime (or lemon…I always have a lime on hand) for tartness, and the rosemary to add some depth, the filling mixes together in minutes and is ready to scoop into mini graham cracker crusts. I picked mine up in the baking aisle, and they are also super easy to make with some crushed graham crackers and butter pressed into a cupcake or tart pan. I mixed the sweetened condensed milk, cream cheese, and lime juice filling by hand with a whisk, then finely chopped the soft leaves of the fresh rosemary and added a pinch. A 1/2 cup ice cream scoop worked perfectly to proportion the mini cheesecakes, but a regular spoon would also work well. 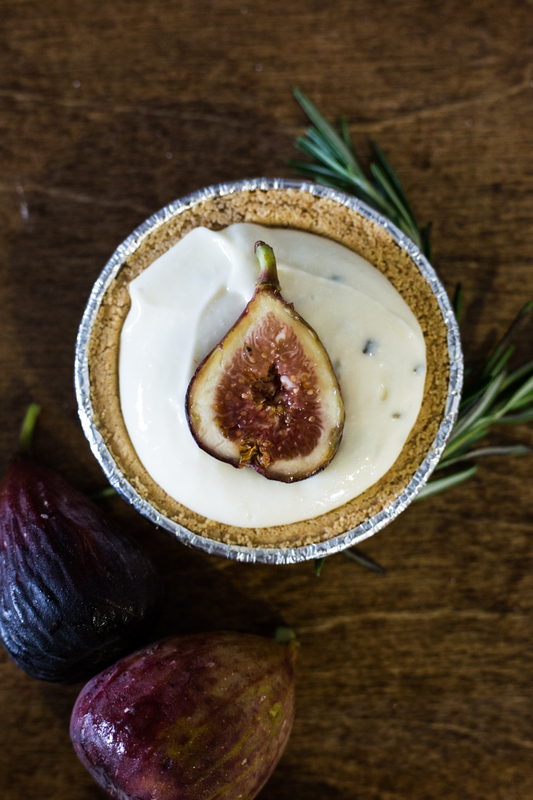 Once the thick, dreamy filling was in place, I cut each fig in half and set one half open-side-up onto each little tart. They are almost too pretty to eat. But also delicious. The filling is nice and thick at this point, but I popped mine into the freezer to chill for an hour while we enjoyed dinner. When I pulled them out to eat, they were perfect. My kids devoured them (Eliot laughed that I had put “grass” in the dessert, referring to the rosemary. Haha) I decided I’m a convert to the quick, lovely, creamy dessert tart and am excited to come up with some new combinations to add to my sweetened condensed milk and cream cheese base. Add a little cinnamon and vanilla for a wonderful fruit dip, some pineapple and toasted coconut for a tropical treat, or peanut butter and chocolate to spread on top of brownies. Yum. 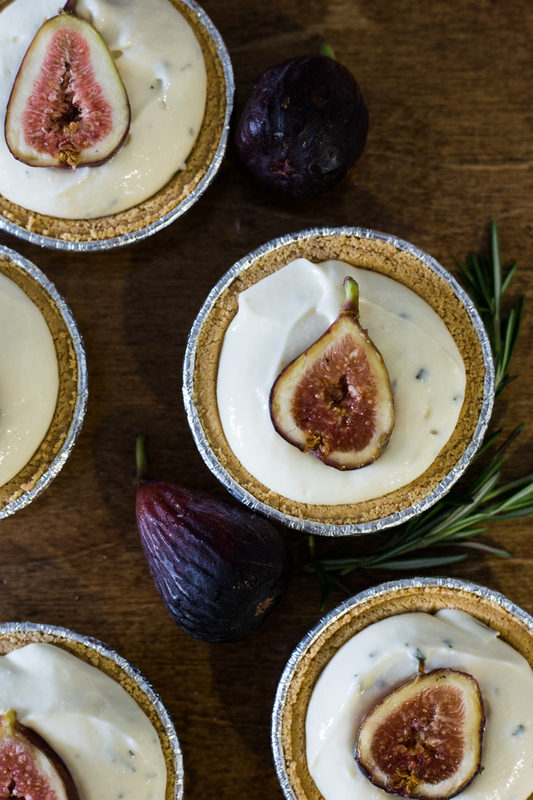 And Rosemary Fig No-Bake Cheesecakes? I will definitely make these again. In a bowl, whisk sweetened condensed milk, cream cheese, juice, and rosemary. 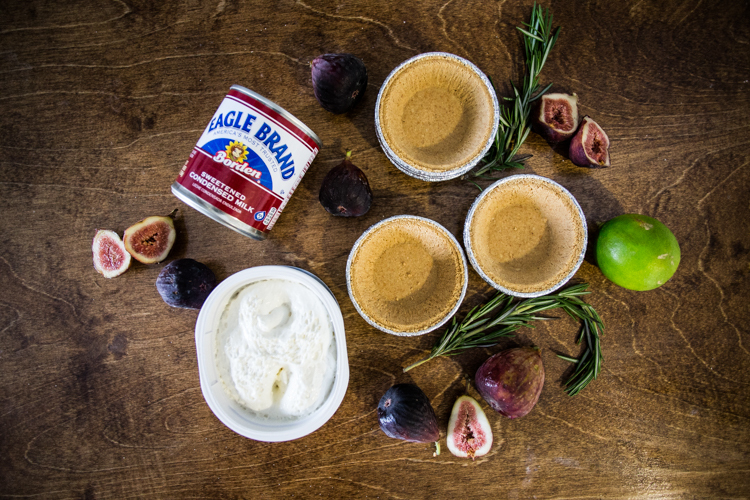 Scoop into graham cracker crusts. 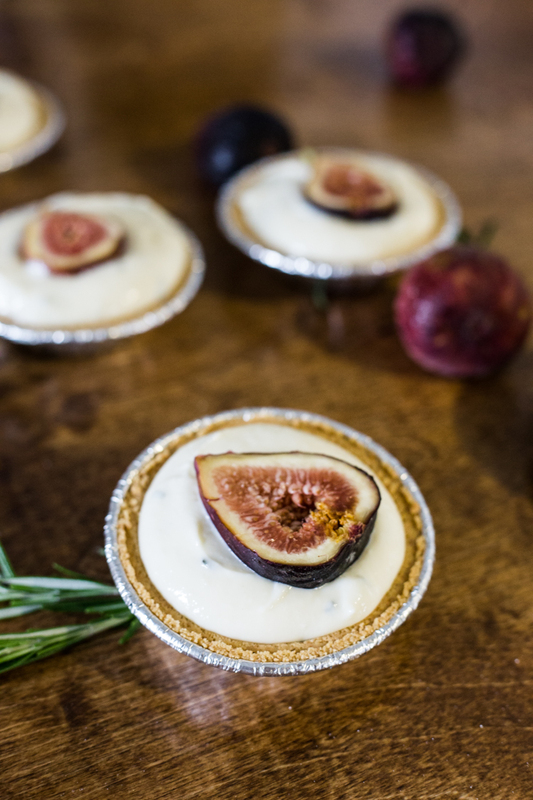 Slice Figs in half and set one on each tart, cut side up.